The Hoboken Police Department loves my dog Trista. That’s because she plays dead with the flourish and drama of an opera diva. Trista is probably the first dog my sister-in-law Lisa has ever touched; her heart was melted by a big meaty paw offered in a companionable shake. Kids tend to be scared of her, too, especially when her panting reveals a full display of teeth but, when she becomes a furry acrobat, launching to jump over my leg, little legs pop up everywhere in invitation! Tricks are more than just gimmicks – they are avenues of endearment, especially for large breed dogs. They also offer your pooch mental challenge and build confidence. 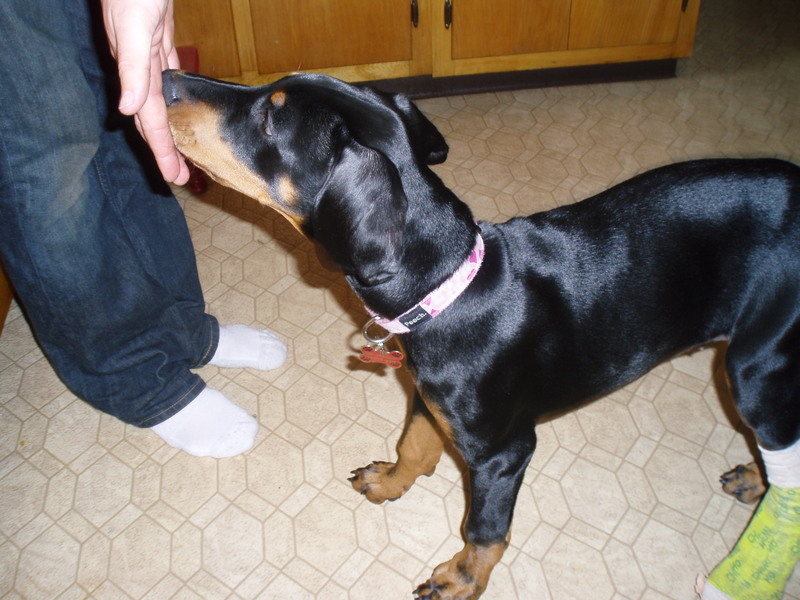 “Touch” (hand targeting): Start by putting your flat hand (palm forward) casually to the side of your dog’s nose. Remember to mark the very moment his nose touches your hand with a “yes!”. Gradually you will notice him touching your hand purposefully. Then start holding it farther from him, making him move to the hand. Make this a fun game! When he’s consistently touching his nose to the flat hand, say the verbal command “touch” first, then hold out your hand. This can make for a great recall as well as a trick. “Jump”: Hold your leg out in front of you (at a height appropriate for your dog) and hold your open palm above your leg. As he moves toward it, arc your hand over your leg and away from him. This will lead him spatially over your leg. If you’d like, you can precede the hand prompt with the verbal cue “jump!” once the behavior is coming fairly fluently. At some point, the sight of your leg will become your dog’s cue for jumping and you will no longer need to lead with the hand signal. “Tippy Toes”: Hold your open palm steadily above your pup’s head, at a height that he can touch by standing on his hind legs. If you’d like, you can precede the hand prompt with the verbal cue “tippy toes!” once the behavior is coming fairly fluently. “Spin”: With your dog in front of you, hold your open palm at his nose height. Lead him around in a tight circle. If you’d like, you can precede the hand prompt with the verbal cue “spin!” once the behavior is coming fairly fluently. Shake is more than just a trick. It helps your dog get more comfortable with people touching his paws. “Shake”: With your pup in a sit, have a treat in your hand just in front of his nose, either in your closed fist or pinched in your fingers so that he can’t get to it. The hope is that, in his frustration, he will bat at the treat hand. If this happens, mark it with a happy “yes!”, grab the paw with the other hand, and open the treat hand to reveal the treat. If the frustration method isn’t working, try holding the pinched treat above your dog’s head and off to one side. By rocking him to the side, often he will pick up the opposite paw to reach. Mark it with a happy “yes!”, grab the paw with your other hand, and open the treat hand to reveal the treat. After he is consistently offering a paw, say the verbal command “shake” or “give paw” in front of it. Additional note: By using the rocking method, you can train a “left paw” and “right paw” behavior. “High 5”: Just change the position of your hand so that it’s ready to receive a “high 5” when your dog does the “shake” behavior. “Wave”: Now give the hand signal for “shake” but instead of keeping your hand stationary to receive your pup’s paw, move it horizontally in front of him. This will cause him to lift his paw a little longer and perhaps even make another swipe to meet your hand. Especially reinforce any extra jabs in the air. Shaping is a training technique in which successive approximations of a behavior are reinforced until the goal behavior is accomplished. “Are You Shy?”: We want your dog to put his head on the floor between his paws. Start with him in a down. Say “yes!” and treat for a slight head duck, the head bobbing down just a bit from level. As always, behaviors that are reinforced (rewarded) are more likely to be repeated, so your pup will start to duck his head more often, but in some of the repetitions he’ll duck a bit lower than others. Once it’s become a consistent behavior, start clicking only for those lower head bobs. You’ll notice that your dog will start to bob his head lower and lower. At some point, reinforce only for those bobs where his jaw actually touches the floor, even if just for a moment. Do you see how we’ve shaped this behavior just by selecting for successive approximations? Don’t jump to the next level of performance until your pooch is consistently offering the current level, or you will get a weak behavior that is easily lost. Training by capturing means that, rather than manipulating your dog in some way to perform the behavior (like luring him to shake), you wait for him to voluntarily perform the behavior and then reward it. “Allergies?”: Whenever your pup happens to sneeze (or if you elicit a sneeze), say “yes!” and give him a treat. As always, behaviors that are reinforced are more likely to be repeated, so over time he is more likely to sneeze because he’s been rewarded for it in the past. Once he starts to sneeze with predictable regularity, place your verbal cue just in front. “Go Find It!”: This is a game of sniffing out a fragrant piece of food. To install the command, we want “Go find it!” to indicate that there is food somewhere out there for the hunting. Start easy by saying “Go find it!” and tossing a piece of kibble. Make it easy to find. When this is comfortable, take a fragrant piece of food, put your pup in a sit- or down-stay (or have someone hold him) and plant the food somewhere in plain sight. Release him and instruct him to start hunting by saying “OK, go find it!” As your dog gains fluency, make the treat increasingly well hidden – in another room, under furniture, in his crate, inside a toy on the floor, wherever… be creative. And you can hide a couple of treats at one time; when he’s found the first, repeat the command “go find it” to indicate that there’s still another out there somewhere. Just a note, though: Don’t hide the tidbits in places where you don’t want him hunting, like on a table top, which would encourage counter surfing. Also, if your pup breaks the stay, put him back in it. What he’ll learn is that breaking the stay delays his favorite game!